Let’s start off with the most interesting fact about glass. At room temperature it’s actually a liquid, and not a solid. Yes, glass really is a liquid and over a long period will run. If you’d like to find evidence of this, any church with very old glazing will have wafer thin glass at the top of the pane, and then really thick lower down. Quite amazing and fascinating at the same time! If you was to inspect the featured image above closely, you would find evidence on every single pane of the lead light you can see there! This is no exaggeration when I say there are literally dozens of different glass types and double glazed units all having different purposes. Some glass is designed to reduce heat loss, some glazing is specifically designed to reduce noise pollution, improve sound proofing, or for safety first. In fact there are many reasons . Some of this glass represents excellent value for money, and some cost isn’t a factor, it’s all about having the very highest standard or finish applied to their sash windows project. When you’ve finished reading this article there’s every chance you will know more than most sash window professionals about glass and glazing. It’ll also result in being able to make an informed decision on your sash window glazing, as well as pick the best value for money given your individual circumstances. 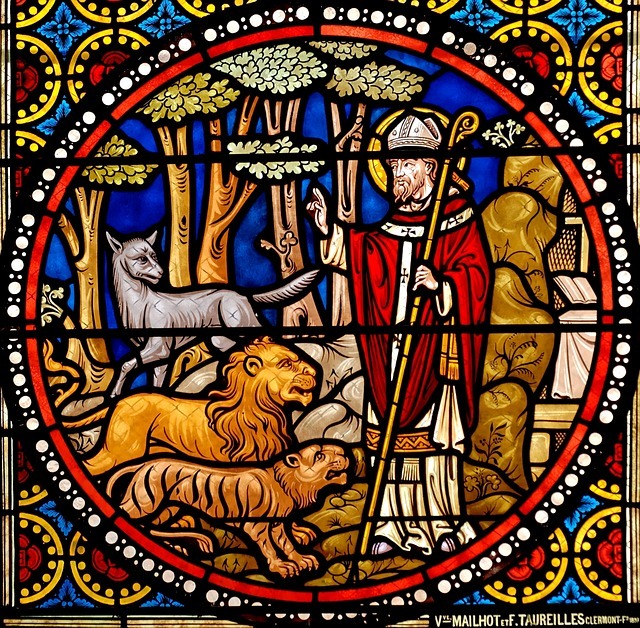 This article is extremely lengthy and goes into great detail each glass type. So if you already have a glazing option in mind it’ll help you make your way through this article more efficiently. Single pane glass is the most common form of glazing to be found in sash windows. London has millions of single glazed sashes. The benefits of single glazing mainly boil down to the low cost. It is however not the best for heat insulation and sound proofing. Below is a list of the single glazed types and their best/worst uses. Architectural salvage glass is old glass which has blemishes and imperfections. It’s normally very thin, around 3mm in thickness. It’s most commonly used in listed buildings. It can actually be a requirement replace glass like for like and therefore architectural salvage glass can be specified. This is very beautiful and so authentic looking, but comes with a really serious price tag. The last time I ordered architectural salvage glass the cost was £2500 per crate. This was a long while back, I expect the price to of doubled, if not tripled by now! The cost equates to around £200 per square metre which is pretty similar to the cost of a quality high end, double glazed unit! So not particularly good value at all when considering heat, sound, and safety. In fact for those three disciplines, it’s the worst out there! 4mm clear float glass is the most common glazing found in London. It’s used because it’s cost effective, it’s not too bad for heat insulation, and it’s light enough that traditional cast iron sash weights can counterbalance it allowing full travel of the sash window. At around £70 per metre squared, it really is the right choice if you are on a budget. It also works remarkably well with a draught proofing system. In terms of heat insulation and value for money, single glazing and a draught proofing is remarkably the best you can do for your property. Energy Savings Trust have come to the conclusion that for every sash window draught proofed you’ll save £25 per year! Some people quite like it for security as well. The reason being is when broken the glazing leaves nasty shards of glass everywhere to climb through. This is just not possible unless you plan on injuring yourself badly. Here’s a look at that. 4mm float glass broken by a stone. 6mm clear float glass is arguably the least useful glazing option for sash windows because of the modern alternatives available. Both 4.4 & 6.4mm safety laminate are considerably better for security and safety with the price point being very similar as well. In time gone by it was an upgrade from 4mm in terms of security and noise reduction. Now however, it’s so far behind it’s almost not worth mentioning. 4mm obscured glass comes in many patterns and styles. 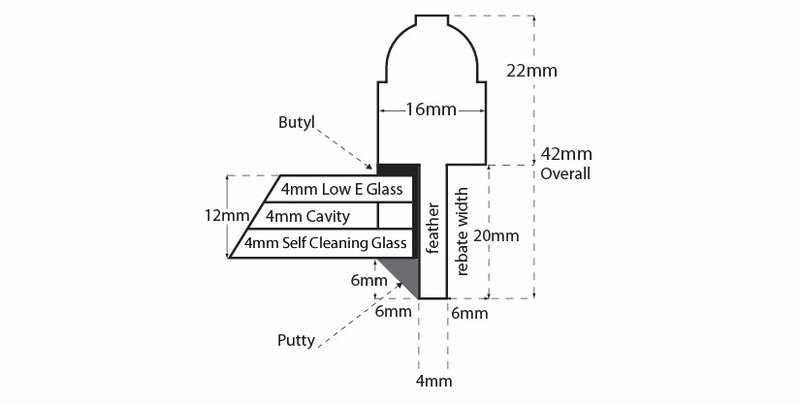 Most typically, and almost always we use a satin or sandblast 4mm clear glass. The difference is significant if we consider they look almost identical! The satin glass is chemically etched, while the sandblast option is just that, physically sand blasted. What are the pros and cons of using satin or sandblast obscured glazing? Well this is quite interesting actually. Sandblast glass has the distinct disadvantage of being extremely difficult to clean. Dirt and dust can get into the tiny indentations made from the physical sandblasting. Getting it out is a painstaking task that required warm soapy water and then you’ll need to mop up the soap or that will leave a residue. I don’t want to put you off sandblast but this is the reality of it when not used in a double glazed unit. Satin on the other hand cleans really well because the glass isn’t scratched as deeply as sandblast. It’s also only a bit more expensive than sandblast. It does look better and more modern as well. There’s only one drawback – when the glass gets wets it will become transparent! This is obviously not ideal because the condensation from showering is exactly enough moisture to turn the glass see through! This completely defeats the purpose of using it in the bathroom in the first place. So all in all price wise there’s not a great deal in it but I would go with the sandblast. Although it’s difficult to maintain, it does it’s job properly and still looks nearly as good as satin. There are many patterned glass styles to choose from if you like that type of thing. The best bet is to head over to Pilkington and take a look at their up to date ranges. There’s many reasons to upgrade the single glazing in your sash windows. Firstly, if your window is below 800mm from the ground then it is now a legal requirement that the glass when replaced, it should be with safety glazing. The main comparisons here are 4mm toughened and 6.4mm laminate and I will go into the uses in detail. 4mm toughened glass is one of the best glazing options for single glazing if you’d like to improve the security and safety of your home. The cost is approximately twice that of 6.4mm laminate but easily as strong. It doesn’t offer the thermal insulating properties of 6.4mm laminate safety glass either, but what is does perfectly is fit into a standard sash window rebate without any alteration because it’s depth is equal to the original glass thickness. Here’s a look at how it breaks safely. Toughened safety glass – a great install if you are concerned your children may break the glazing. This leads to the major benefit of 4mm toughened glass – there’s no impact on the original sash window weighting mechanism. This is extremely important because counterbalance is expensive. Let’s take a typical example of 6.4mm laminate which is approximately 60% heavier. That means a 20lb original sash with 4mm toughened glass will weight 32lb when glazed with 6.4mm laminate. This additional weight offsets the difference in price between 4mm and 6.4mm laminate safety glass. There’s one small issue with 4mm toughened. It takes over a week to order because of the heat treatment required. This is very difficult to workout for a small job, however on a larger job of many days poses no problem at all! Overall the use of 4mm toughened is a tough one to weigh up when compared to 6.4mm laminate. When considering ease of installation, 4mm toughened comes out on top, and also toughened will never break unless hit with something outrageous. You can literally take a sledge hammer to it before it will give way. That said, the increased thermal benefits of 6.4mm laminate safety glass make it an equally attractive prospect. Given there’s little to pick between the two this comparison should probably judged by prices quoted. I would go for the cheaper option. There’s a laminate glass for almost every single purpose you can imagine. If you are looking for sound proofing, security, or heat retention, laminate can help and I intend to discuss all the options and where good value can be found against single and double glazing by drawing comparisons. 4.4mm laminate safety glass is almost always used when 6.4mm laminate is either too heavy, or the sash rebate isn’t quite deep enough to take the thicker glazing option. That, and when there’s no time to wait for 4mm toughened glass to be manufactured. 4.4mm laminate safety glass is about 20% cheaper than 6.4mm laminate. It isn’t as good for heat retention and it’s also not as strong when considering sash window security. It has the benefit of not altering the original sash weighting, however given the normal reasoning behind laminate glass is improved security or safety, I would be keen to take advantage of the 6.4mm laminate safety glass whenever possible. I would also most certainly use 4mm toughened ahead of 4.4mm laminate if there wasn’t any issue in glass delivery time constraints. 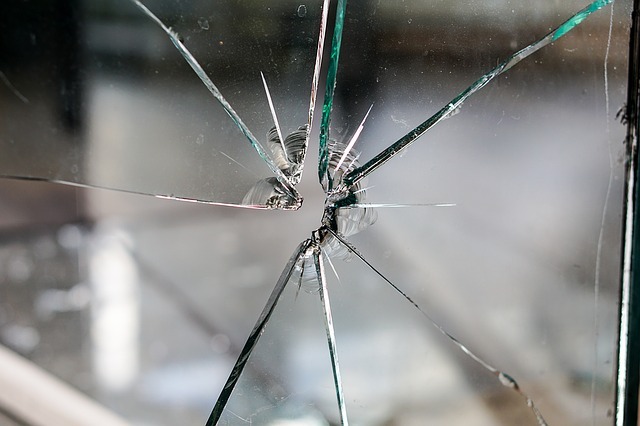 If you’ve been reading the entire article, then you will understand that 6.4mm laminate safety glass is the all rounder when it comes to safety and security, with the only drawbacks being the additional weight and thickness for old sash rebates. Both of these are only minor issues and it certainly is the pick of glasses when considering the important three; heat, safety, and security. A picture of 6.4mm laminate safety is best shown broken. 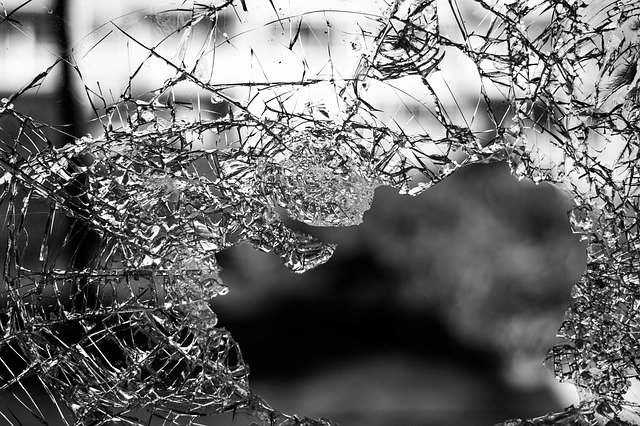 Notice, if you had small children, they would be much safer because larger chunks of glass don’t fly everywhere when broken. Laminate safety glass – another great install if you are concerned your children may break the glazing. More reading and comparisons on 6.4mm laminate safety glass can be found in the 4.4mm laminate safety glass section and 4mm toughened glass sections. Acoustic glazing is a tricky one. About ten years ago it was the rage to have a thick piece of glass to reduce noise pollution and improve sound proofing. It since been recognised, without really being said by the makers of this glass, that acoustic laminate works incredibly well as part of a double glazed unit, and not on it’s own. What we are effectively talking about here is triple glazing! 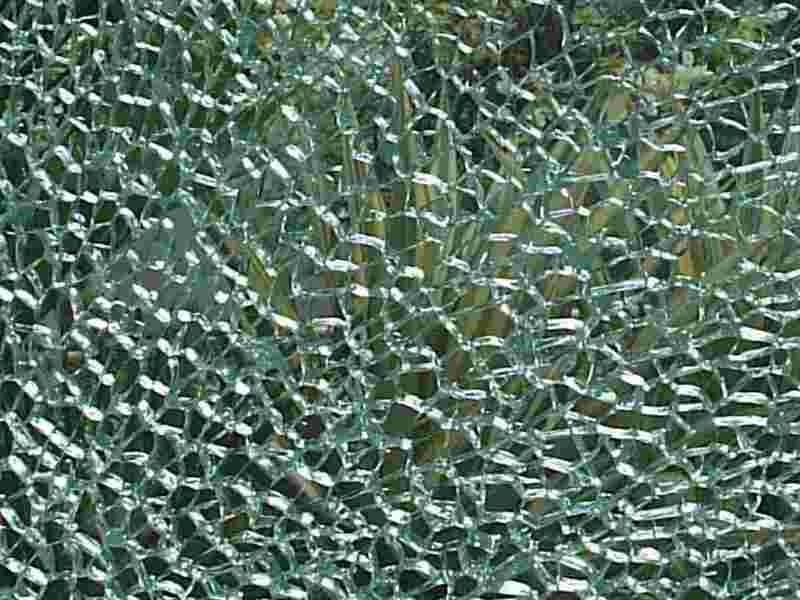 Here’s a look at acoustic laminate safety glass. I have installed 10mm acoustic glass into properties before now and clients have been underwhelmed by the results which is disappointing considering the huge costs involved with this glass. 10mm thick glass is seriously heavy, and takes a great deal of expensive lead weight to counterbalance the sash – notice it could go to 16mm but that just isn’t appropriate for sash windows, it’s too heavy. The weight of the glass is also a strain on the sash itself. Much better performance and results can be achieved from low quality 4-6-4 double glazed sealed units that are a fraction of the price. I am not saying acoustic laminate isn’t good. I am merely pointing out standalone, value for money wise, it’s not the best out there. If you are looking for top end triple glazing where money is no object, then this is the right glass however. If you’re looking to sound proof sash windows, or vastly improve heat retention, double glazing sash windows will be well worth reading as you’ll find the best value for money, striking a balance of performance and price in this section. Unsurprisingly there are good value double glazed units that offer overall performance, as well as top of the range, latest technology, which offers diminishing returns in value, however the information is all here for you to decide what’s best for your sash windows and your home. 4mm-6mm-4mm double glazed units are made of two plain panes of glazing and the cavity is not filled with an inert gas. The cost of such unit is the cheapest and often works well when double glazing the original sash windows. 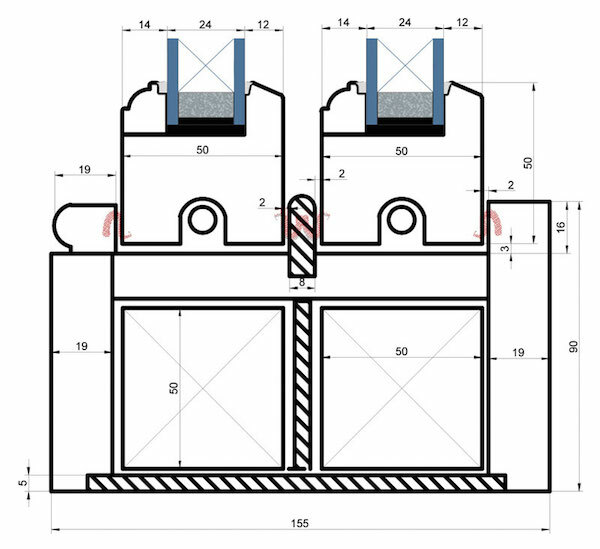 If it all possible however, we will install the 4-8-4 Pilkington low-e as you’ll note if you follow the link provided. If a sash isn’t deep enough to hold a 4-8-4 and you don’t want to spend a great deal of money on a slim line unit then it is a good balance for heat and noise purposes. As mentioned in the 4-6-4 write up if we are looking for good value for money when double glazing our original sash windows then it will normally boil down to one of these two units. This unit is highly preferred because it’s superior in U-Values, and being factory made, it will almost certainly last longer than a 4-6-4 unit which is handmade. Here’s a look at this brilliant unit. It’s very efficient, it lasts well, it’s cheap, and it can normally just about be fitted into single glazed sash windows. It’s certainly the best value for money out there by a long stretch. These double glazed units are ideal for new sash windows. The depth of the sash can be made large enough to incorporate a large unit. The U-Value, sound proofing, and insulation security of these units is extremely effective. Much better than a 4-8-4 unit but then the replacement window cost is over double that of double glazing the original sash windows. This 24mm cavity double glazed unit is incredibly good at keeping the cold out as well as the noise pollution down. The difference over a standard 4-8-4 Pilkington unit is not that significant however is better on the noise. I mean sure if you use fancy dB meters and heat meters measuring what heat bounces back into the room off the glass, this unit is better. Once you have double glazing though a large portion of the job is done, and standard double glazing making use of the original frames is considerably cheaper. Listed building have had a slice of luck recently with the invention of the slimline unit. It offer genuine protection from the elements in a similar fashion to standard double glazed units but can be installed into almost all single glazed rebates. If you’d like a lot more detail about double glazing and repairing listed building sash windows then please follow the link provided. Here’s a very nice example of just how ornate a sash can be, and still benefit from slimline double glazing. There’s always a drawback though and that is the cost is quite hefty considering the thermal properties. In short a slimline double glazed window using existing joinery will cost in region of £800 per window, almost 30% more expensive than standard double glazing, and of course, it is good at insulating but it’s not as good as a standard unit. Rather than go into the specifics here, it better to read the slimline vs standard double glazing article. 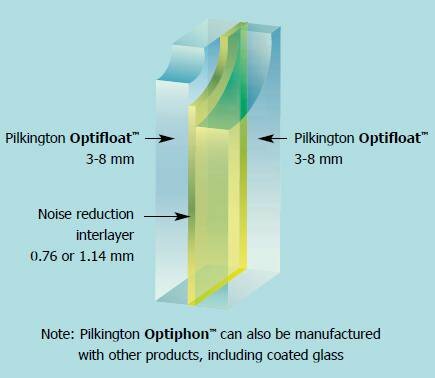 Most triple glazing options for sash windows involve the use of acoustic Pilkington Optithon glazing that is then joined to another pane of low-e glass. The results are incredible in terms of noise reduction and significantly better than any double glazing option. It does cost considerably more though. Normally it would increase the price of a new double glazed sash window by as much as 25%.